Taipei, Dec. 13 (CNA) Taiwan's Ministry of Foreign Affairs said on Friday it was regrettable that Japan's Foreign Ministry has now posted a propaganda video on the Diaoyutai Islands on its website in many languages and urged Tokyo to handle the issue in a cautious manner. Taiwan has conveyed through diplomatic channels its position that the "inappropriate act" was not acceptable, the MOFA said in a statement. The act cannot change the historical fact that the Diaoyutais belong to the Republic of China (Taiwan), the ministry said, and it stressed that the move did not contribute to regional stability. The ministry was referring to the addition earlier this week of foreign language versions of a video on Japan's position on the islands first posted in October. The English home page of Japan's Foreign Ministry contains an "In Focus" section listing issues that include territorial disputes over the Diaoyutais (the Senkakus in Japanese) and North Korean issues. 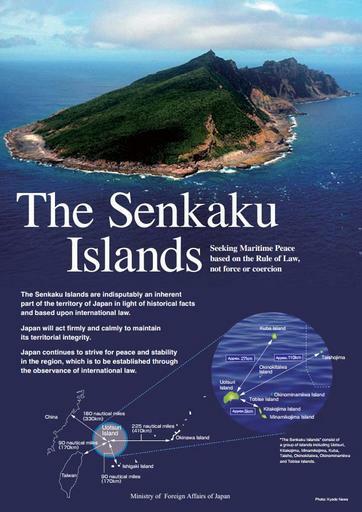 A click on "Japan-China Relations: Current Situation of Senkaku Islands" takes the Internet user to a new page containing links to a leaflet and a short video, both of which are in 10 foreign languages, including Chinese, Korean, English, Portuguese, Russian and even Arabic. The ROC government has urged the Japanese side to handle the issue in a cautious manner in order to avoid damage to peace in the East China Sea and the relationship between Taiwan and Japan, the MOFA said. The uninhabited islands under Japanese control are located some 190 kilometers from Taiwan's Keelung harbor and are claimed by both Taiwan and China.